When you were a kid, your parents probably followed you around the house shutting off lights, radios and televisions. That’s a good start, but today it doesn't completely solve the problem of wasted electricity. Did you know that your television may be using as much as 4 watts even when it's turned off? A cable DVR will use 27 watts in standby mode. In fact, your entire home theater system may be sucking as much as 34 watts when asleep. Even that little cell phone charger is still drawing about a .5 watts when it's not connected to your phone. Individually, these amounts are small, but altogether, over time, it amounts to a lot of wasted energy and wasted money. Who has time to constantly monitor all these energy vampires? 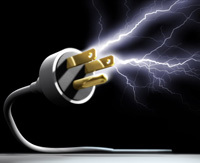 Rather than walk around the house unplugging everything that's not in use, there are power strips with surge protection that can make being a power monitor much easier. Belkin Conserve Energy 8-outlet Surge Protector ($29): This 8-outlet surge protector includes both switched and always-on outlets. Use the wireless remote to turn the power off for all switched components. 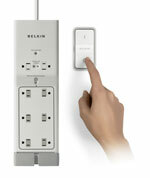 Belkin offers a range of outlet management products on Belkin.com. 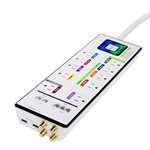 Monster GreenPower MDP 900 ($80): This computer power strip will automatically cut power to any peripheral plugged in (printers, scanners) when you turn off your computer. Monster GreenPower HDP 1850G ($499): Kills all power to selected connected home theater components (HDTV, DVD, surround receiver) when you turn them off, eliminating vampire power drain. It also comes with a remote control receiver that will work with any programmable remote, so you can keep your components hidden. Plus it cleans up power, which helps extend the life of your products.